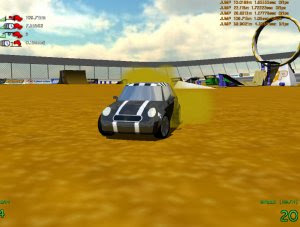 Stunt Playground is a fully 3D stunt driving game for the windows PC. the game features extremely realistic physics that are fully integrated into both the driving, and the editor as well. this means you can arrange the various props and jumps in any way imaginable. of course you can save and load your creations for later as well. While driving you can also record "instant replays" up to 15 seconds in length, and then playback your stunt from any angle. you can even save/load these replays, so your friends will believe you! The game features impressive 3D graphics including realtime shadows and reflections. * Save and Load (and share) instant replays!